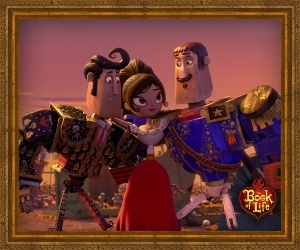 From the very beginning, the cultural heritage of Jorge R. Guitierrez’ animated feature The Book of Life is readily apparent, as a mysterious tour guide tells a group of schoolchildren a story that takes place in Mexico, “the center of the universe.” From then on, the film is a non-stop celebratory ride through the imagery and meaning of Día de los Muertos. The uniquely gorgeous animation style is meant to represent wooden puppets which are acting out the tale of María, Manolo, and Joaquín on a small stage in front of the children, in a seemingly forgotten room of the museum they are visiting. In other words, it is a simple fable, told in a straightforward and heartfelt way. There is a love triangle, a bet between the gods, and plenty of good-natured humor to spare. In case you are unfamiliar with the story, in honor of the Day of the Dead, the gods and rulers of the Land of the Remembered and the Land of the Forgotten – La Muerte and Xibalba, respectively – make a wager for control of the Land of the Remembered. They choose two boys who are in love with the same girl and, each making one their champion, wait to see who will claim her heart. Cheating Xibalba tricks La Muerte’s champion Manolo into giving his life for his beloved María, but he is not to be dispatched so easily, taking on death itself with the help of his deceased family members. The cast is wonderfully diverse, featuring Diego Luna and Zoe Saldana as Manolo and María, Ice Cube as the Candlemaker, and Kate del Castillo as La Muerte, with plenty of other well known Latin@ actors in smaller roles, such as Hector Elizondo, Danny Trejo, Carlos Alazraqui, Ana de la Reguera, Gabriel Iglesias and Cheech Marin. Latinidad permeates the film and makes it feel more like a love letter to Mexican culture than an exploitation of its beauty and mystery. Tongue-in-cheek jokes in the film like, “What is it with Mexicans and death?” are not mocking in tone as much as a kind of playful jab exchanged by family members. Other reviews have criticized the mix of pop culture in the film, such as the use of popular songs like “Creep,” “Just a Friend,” and “Little Lion Man” performed by characters, as trying too hard to make a folkloric tale seem modern and relevant. I saw these elements as part of a fun and well-executed nod to multiculturalism. Manolo may be a Mexican boy surrounded by cultural markers, living a story about the Day of the Dead, but he can still belt out an angst-filled white-boy ballad when he feels lost and alone. These moments just go to show that some stories and emotions are universal, even if their origins come from different places. As a Chicana living in an area with a large Mexican population, it was incredible for me to go to the theatre and see families and children who reminded me of my own family, watching this movie and laughing in delight at the colors, the characters, and the story. It was so clearly a movie by Latin@s, for everyone, but with a special significance to the Latin@ community, and that touch of latinidad was important and meaningful to me, and I hope, to the families in the audience as well. As I watched the film, including the previews before it for Big Hero 6 and Spare Parts (both films with multicultural casts) I felt a deep sense of joy and hope at the possibility of entertainment becoming more diverse and inclusive by the minute. Maybe it’s wishful thinking, but if The Book of Life is any indication, I believe the next generation is going to be on the receiving end of some incredible stories from all around the world, and that is truly exciting. This entry was posted in film reviews and tagged The Book of Life. Bookmark the permalink.